Heathy and full of flavor! 2 teaspoons of garlic and herb seasoning (like Mrs. Dash) divided 1 & 1/2 tsp. and then 1/2 tsp. Cut one full chicken breast into bite sized pieces. Chop 3/4 cups of diced peppers into small wedges. Add 1/2 TBS olive oil to a large sauté pan. Add Chicken and sprinkle with 1 and 1/2 teaspoons of garlic and herb seasoning. Cook until golden brown and crispy on the outside. Meanwhile, boil water in a pot and add pasta. Cook until slightly tender but still firm. Add half cooked pasta to the sauté pan. Cover and allow to cook through, stirring occasionally. 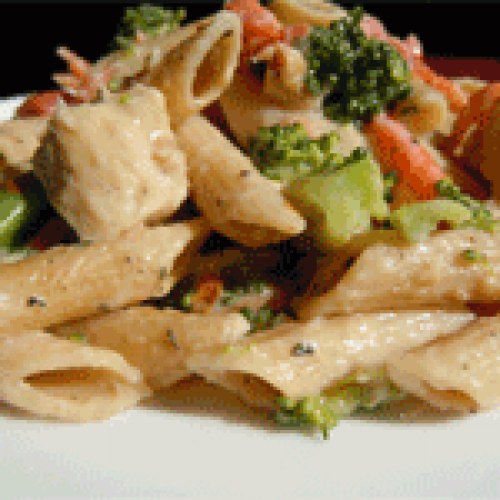 Pasta will absorb the steam from the fresh vegetables and be perfectly tender when done. When pasta and vegetables are cooked, add an additional 1/2 teaspoon of garlic and herb seasoning. Finish by sprinkling 1/4 cup of fresh grated parmesan cheese and serve.